Florida Hurricane Attorney has just processed NOAA Images of Tropical Storm Debby from the GOES Satellite. It is raining heavily after the eerie sunset. Waves are getting bigger as Sunday morning approaches. Not a pretty sight. Photo of Tropical Storm Debby at Sunset from Gulf Coast. Florida Hurricane Attorney is watching the Gulf of Mexico this weekend for the strengthening of what may become our next Storm, Tropical Storm Debby or Hurricane Debby. Update Sunday Midnight: The storm has been classified as a Tropical Storm. As the Hurricane video update below stated, "As of 8 p.m. Thursday, the low-pressure system — now moving northward over the Gulf of Mexico and pulling rain and wind toward the region — has a 70 percent chance of becoming a tropical system by Saturday." The National Hurricane Center reports, “It looks like it has the makings of becoming our next tropical depression,” said Stacy Stewart, a senior hurricane specialist at the center. One South Florida media source forecasted, "South Florida can expect heavy rains, thunderstorms and possibly localized flooding through the weekend. 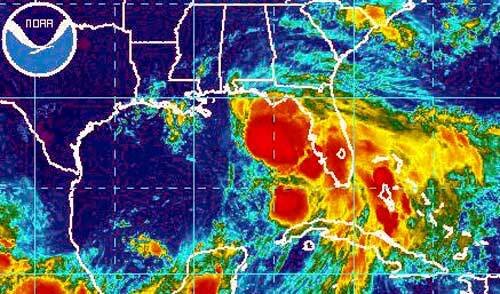 The system will also affect western Cuba and the central Bahamas."